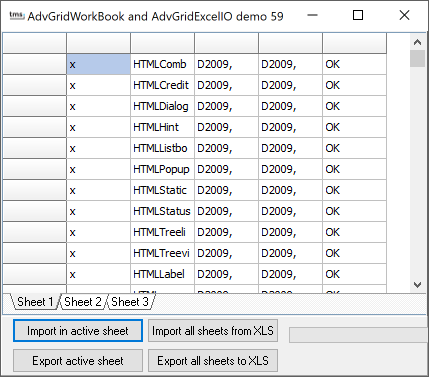 The new TAdvGridExcelIO component is TAdvGridWorkbook aware, making an almost codeless solution possible to load and save multisheet XLS files. TAdvGridExcelIO has now 2 properties: AdvGridWorkbook : assign a TAdvGridWorkbook to this property if you want to use it with a workbook. AdvStringGrid : assign a TAdvStringGrid to this property if you want to use it with just one grid.